Pay $0 closing cost using us as your agents! Contact us anytime if you have any questions or if would like to schedule time to view the home. 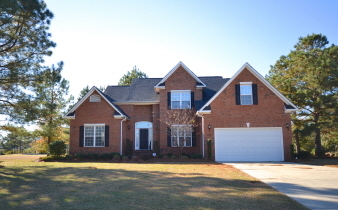 Interior Features GORGEOUS HOME WITH A GREAT OPEN FLOOR PLAN & LOCATED ON THE GOLF COURSE! BEAUTIFUL VAULTED GREAT RM W/SPECTACULAR WINDOWS. FORMAL DINING RM & EAT-IN KITCHEN. LRG 1ST FLOOR LAUNDRY RM W/WASH BASIN.SPACIOUS 1ST FLOOR MASTER SUITE W/DUAL VANITY & JETTED TUB. UPSTAIRS LOFT & 3 LRG BR'S. 4TH BR IS THE BONUS RM W/2 CLOSETS.LOTS OF CLOSET SPACE. DECK & STAMPED CONCRETE BACK PATIO OVERLOOKS GOLF COURSE. NO HOA DUES! MOVE-IN READY & PRICED TO SELL!